The billionaire Koch brothers attempted to wield political influence over appointments and teaching at a major US university in exchange for donations, newly published documents reveal. Internal emails and memos from the economics department of Florida State University (FSU) open a window into the kind of direct pressure the Kochs seek to exert over academic institutions in return for their largesse. The 16 pages of documents, obtained by the Center for Public Integrity, show that the energy tycoons demanded through their grant-giving arm, the Charles Koch Foundation, a role in faculty appointments and an emphasis on teaching that was in tune with their radical political views. Charles and David Koch are major funders of the Tea Party and other ultra-rightwing movements that oppose government intervention and advocate for an unregulated free market. A section of the memo headlined “Constrained hiring” says: “As we all know, there are no free lunches. Everything comes with costs. In this case, the money for faculty lines and graduate students is coming from a group of funding organisations with strong libertarian views. These organisations have an explicit agenda. The documents date back to 2007, when the Koch deal was first being negotiated with FSU. Among the other demands made by the foundation was that Benson, a free-market libertarian who shares many of the Kochs’ beliefs, must have his term as chair of the economics department extended for three years as a requirement of the donation. The Koch’s financial gift was finalised in 2009 at the sum of $1.5m (£920,000) to be spread over six years – a drop in the ocean for the brothers who own the second largest privately owned company in the US and are valued at $36bn each. The university says that as of April this year it had received $1m. Under the initial deal with the Kochs, they had direct input into the appointment of faculty members in the economics department through a three-person advisory board set up specifically to liaise with the Charles Koch Foundation over hiring. The terms of the donation have been a running sore within FSU, prompting considerable internal opposition. In the face of widespread criticism, the university authorities in 2013 revised the terms of the Koch funding to weaken the brothers’ grip on appointments. A statement from the university released earlier this year said that “the decision was made to eliminate any role whatsoever of the advisory group in the hiring of tenure-track faculty members in the department of economics”. Benson did not immediately reply to questions from the Guardian. But he told the Center for Public Integrity that the documents had been intended for internal use and were written at “early stages of discussion” over the Koch grant, well before it was finalised in 2008. 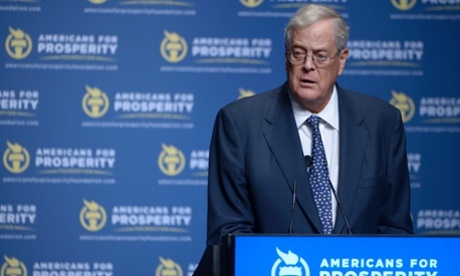 Florida State University is not the only academic institution that the Kochs have financial relationships with. According to the CPI, the brothers dispensed $13m in 2012 to 163 colleges and universities.